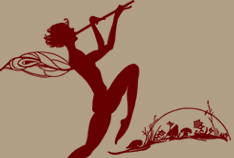 The Ruby Short McKim Collaborative is proud to debut in the New Year of 2011. The seed was planted in the summer of 2010, when this wonderful group of women agreed to mentor this project. JANETTE DWYER has been a quilt enthusiast/fabric manipulator since 1984. She owned a quilt shop from 1999-2005. In the back of her mind, she has always loved quilts and in 2007, she decided to pursue an item on her "wish list" and became a quilt appraiser. In 1984, she fulfilled her first lifelong dream of marrying her farmer and being able to work along side him on their own farm. Her first love is her husband, Mike and two gorgeous daughters, Erin and Bethany. Her second passion is hand quilting and doing embroidery work. "I have to admit. I didn't even know who Ruby Short McKim was before I became a quilt appraiser. Such quilt history we have to learn as an appraiser! I first became aware of Ruby when I purchased a State Flower Quilt at an auction. I wanted to know more about her, never even dreaming one day that I would be in touch with the family. What an honor and privilege for me. The quilting world seems to continue to send wonderful people into my life, like Merrily, for instance. When you love what you get to do, it isn't really work at all. I am truly blessed." Independence, MO CHRISTINA FULLERTON JONES is the eldest grandchild of Ruby Short McKim and spent the first four years of her life living above the Studio and next door to Ruby's stone house on Lexington. "Probably the greatest lesson I learned from Ruby, as my grandmother, was to always try everything once. She gave me freedom to come and go throughout the Studio, allowing the artists to set me at a corner on a table with glue, paper, beads, buttons, scraps of paper or fabric and just 'create' whatever I wanted, whenever I wanted...not telling me how to do something, but letting me do, praising my results. I was allowed to experiment with art, writing, theater. As an adult I had numerous career paths, twisting and turning like a Crazy Quilt: public relations, publishing, education, business ownership, and raising a family that included a blended family of 5 children. Now in retirement, I publish a monthly newsletter for our high school graduation class; read voraciously; create cross-stitch patterns out of Ruby's quilt pattern designs under the heading of Ruby's Legacy; and enjoy the antics of Pip, Maggie, Pollyanna, and Gracie Allen, the 4 cats who own us. Life has been a grand adventure!" CAROL KELLER has been quilting for 27 years and has been co-owner of Quilter's Garden for 11 years. She's a graduate of Western Illinois University with a degree in Clothing, Textiles and Design. "My love for Ruby Short McKim started the day I saw a quilt made by my mother-in-law, Dorothy Keller, when she was in high school. Donna Kooistra just happened to stop in my store, Quilter's Garden, on the day I had the quilt at our club. She proceeded to tell me all about Ruby Short McKim and it started me on a mission to find out what I could about this pioneer designer. Luckily, it led me to her granddaughter, Merrily. I am thrilled to be a part of this group and look forward to what the future will bring to those who love Ruby Short McKim." Lagrange, IN DONNA KOOISTRA is an AQS Certified Appraiser of Quilted Textiles as well as a teacher, lecturer, judge, collector, and quilter. 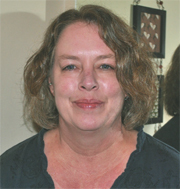 For many years, Donna has participated in and taught classes and lectures on fabric dating and identification, technique, construction, documentation, ethics and current trends in quilting. She is on the Board of Directors of the National Quilter's Hall of Fame and a member of many guilds, both local and national. She is at home in Lagrange, Indiana with her husband Steve, nine children, and 2 1/2 grandchildren! "The Ruby Short McKim project is close to my heart as I come to Northern Indiana from Kansas City, Missouri. I have long admired and enjoyed Ruby's designing work and pioneering efforts. I consider it a privilege to be a part of this project." LANAE REYBURN has been quilting since the early 1990's. A self taught quilter, it began as a personal challenge and took off from there. She enjoys handquilting, embroidery, and needle turn hand applique. She has a wonderful husband, Jerry, and two of the greatest sons in the world that understand her love of quilting. "I first "met" Ruby Short McKim about 15 years ago when my mother gave me several newspaper clippings of patterns that my grandmother and great grandmother had cut from the local newspapers. I fell in love with Ruby's beautiful floral designs and her simple, yet expressive characters. As fate would have it, I then met Merrily through Janette Dwyer. What a fantastic small world! I am truly blessed to be in such great company and to be a part of this wonderful venture." Reardan, WA BARBARA WELLS has always been interested in quilts and quilting, and has been quilting for 40+ years. She is married, has 2 grown children, and 3 "perfect" grandchildren. Three years ago she and her husband moved to her grandparents farm and built their retirement home. She has belonged to various quilt groups and guilds and enjoys the community of quilters. "When I started quilting there were few patterns and very little instruction. I found a book called 101 Patchwork Patterns by Ruby Mckim published by Dover in 1962. I was thrilled to death  I finally had patterns! There were sketches of her appliqué quilts and embroidered designs  I was in LOVE! One day in an antique store I found a set of blocks from the Flower Garden Quilt, winning the lottery could not have been better than finding those blocks. I have been looking ever since. 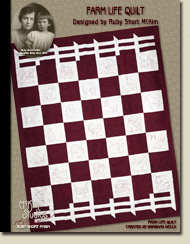 I was thrilled when I found Merrily's website and began making quilts for future great-grandchildren. I am so grateful to Merrily for her work and dedication to her grandmothers legacy!" ROSE MARIE WERNER is an independent researcher from Dundas, MN. She began to quilt in 1997, while working on a charity quilt auction. Since then, her interest in the history of quilting has led her to a research project of documenting 20th century quilt kits. She also collects quilts from the designers and companies she is researching. "I met Merrily, her mother Barbara, and cousin Chris when I went to Kansas City, while researching Ruby Short McKim for a lecture. Delving into the papers at the Jackson County Historical Society, meeting family members, and trying some of Ruby's patterns and techniques has increased my admiration for this wonderful artist and remarkable business woman. The bonus is the new friends I've made as a result." merrily@mckimstudios.com Our plans are to expand the horizons of McKim Studios, which will include a Photo Gallery of Quilts, Presentations, Calendar of Events and New Offerings. We are also planning to create a section on the website for quilt historians and researchers, which will include documentation of patterns, articles written by and about Ruby Short McKim, as well as the original McKim Studios catalogs and marketing materials. The FARM LIFE Quilt featured in this new Ruby Short McKim Collaborative Special Edition was hand embroidered and assembled by RSMC Board Member Barbara Wells of Reardan, Washington. It was quilted by Linda Hanson. Barbara generously donated this beautiful quilt to the McKim Family's Collection. The new RSMC book venue includes color photos of the featured quilt and detailed instructions on how to make it. We're also adding the option of the patterns on CD for only $3.00 with the purchase of the book for easy pattern printing. Of course, this journey starts with Grammy, Ruby Short McKim, and her amazing contribution to the quilt world as we know it. My cousin Christina Jones, the eldest granddaughter, donated many family papers and artifacts to the Jackson County Historical Society (Missouri) to establish the "McKim Papers" archives. She has added to it over the years, and has done an incredible amount of research. I refer to her as the family historian, but she is so much more. My mother also had a stash of Grammy goodies, and in 2005 got me started on this journey. Once we realized the scale of Grammy's contribution and put it out there, this journey took on a life of it's own. I came to realize this past year (2010) that there's so much more than patterns to offer about Grammy's life and work. Not long after I got started (2005) I was contacted by Rosie Werner from Minnesota. She was doing research on quilt kits, and wanted to meet with me. She was the first person I actually met from this crazy quilt world. I made a friend for life, she is near and dear to my heart. She has given me many Grammy treasures over the years, which was my first inkling of how wonderful quilt people are! About the same time, I was contacted by Carol Keller in Illinois. She has a quilt shop there, and had come across an heirloom Flower Garden Quilt. She was doing research on it, found me and ordered several copies of the book for her customers, who were drooling over her find. She also offered me a ton of advice which seemed overwhelming at the time. But with the following events my mind started to wrap around the information she was generously offering. In the meantime, Carol had Janette Dwyer, also from Illinois, come in her shop to do appraisals for customers. Janette was a customer of mine, but we never really visited on a personal level. These two, good friends as it turns out, got to talking about the Flower Garden Quilt, Grammy, my journey, my goals etc. Carol told me that Janette would be willing to embroider blocks for me in exchange for the pattern book. Heck of a deal, huh? The goal was to include a photo of a finished quilt in each book with 'how to' instructions. Once I had time to absorb this offer, and believe that anything's possible, I contacted Janette to see if she was still open to that arrangement. WELL, my life will never be the same! Not only would she help me with blocks, but she's taken me on journey that continues to soar. What a free and wonderful spirit she has ... her generosity and genuine desire to help me achieve my lofty goals are paramount. So ONE of the things Janette did was introduce me to Donna Kooistra, her very best friend. Donna was hosting a meeting in Shipshewana, Indiana the weekend of 11/20/10. She also had some VERY good advice for me. Janette invited me to the November meeting of the Midwest Fabric Study group. I was supposed to be a nice quiet little guest, but Donna ended up billing me as a surprise guest offering a more intimate glimpse into Grammy's life. As I've told you, it went really well, in spite of the fact that I hate the spotlight! What a treasure this experience was for little ole shy me. So now Janette has invited me to join this group, which is the cream of the crop of quilt historians and researchers. I am so honored to have the opportunity to learn from this diverse group! In a nutshell, with my cousin Chris' effort and foresight, my mother's encouragement, Rosie's kind and loving heart, Barbara's generous gifts, Carol's excitement and suggestions for the books, Janette's willing and giving spirit, and sweet Donna's desire to help me out, I'm off!